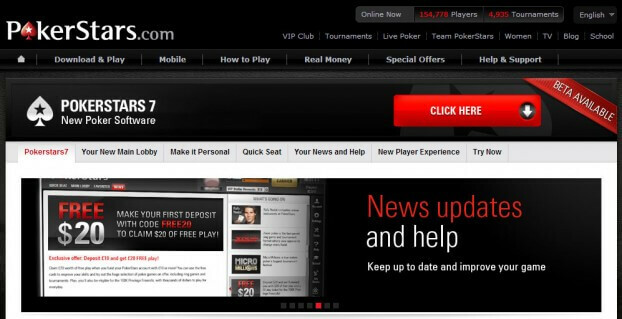 PokerStars who is the world’s largest online poker site has released the PokerStars 7 beta to the public. The beta version of PokerStars 7 is available for players on the .COM, .EU & .ES sites but only for players on Windows. The new redesigned software offers a huge face-lift and upgrade over the existing PokerStars software. Lee Jones who is the Head of Poker Communications had the following to say about the PokerStars 7 Beta. Over the last few years, we have invested countless hours to research, design and develop this new iteration of our flagship software. We believe this release is friendlier for new players and more intuitive and powerful for our veterans. So now we’re inviting our players to test the beta version of the software and help us ensure that it meets the high standards that everyone expects of PokerStars. Players looking for a quick video of the new software can head on over to http://www.pokerstars.com/pokerstars7/ and then click on on the video icon on the right. All of the brand new features are outlined below. QuickSeat – a simple-to-use lobby that allows players to sit down at a game of their choice with just one click of a button, which is particularly good for recreational players or those who want to get straight into a game. Favorites – a new tab that enables players to select and store the exact games and tournaments they regularly play, reducing the need to navigate the lobby each time a player logs in. This can be customized over time, by adding or deleting tournaments, games and tables. Apps – a new easy-to-use bar that sits at the side of the lobby for non-playing functions. It replaces the Options and Requests menus in PokerStars 6. Live events – a dedicated tab that displays all the live events to which PokerStars is running satellites, with simple maps of destinations and the qualifying paths of how to get there. Chip graph – a new feature that tracks a player’s progress through a tournament, in addition to showing the ‘average chip stack’ and ‘largest chip stack’ graphs throughout the tournament.